What better treat could there be than heading off to a friend’s house, with sewing machines and sacks of fabric in tow, for a weekend of mad sewing with three friends? So Ms E, Ms A, Ms G and Ms J escaped from daily lives and headed off to St Gervais. 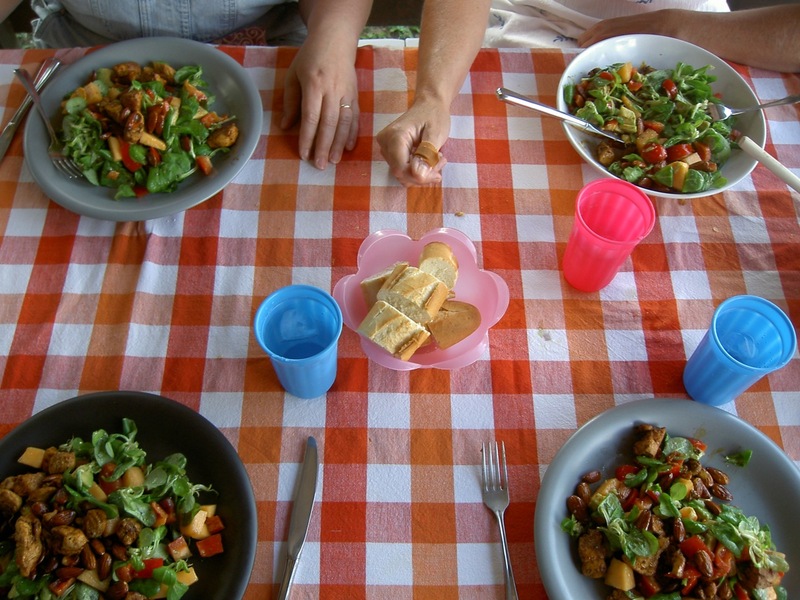 Fathers cared for our respective children (in Belgium, France and Switzerland — a total of 12, of assorted sizes!). We just sewed, be it paper piecing on sofas; sitting all around one big table in the sitting room; or on the table on the balcony. When we could sew no more, we leafed through magazines, imagining future projects. When even that proved too much, in the dark, we tried out Ms G’s hot tub. After all, she’s the expert in hot water relaxation: she sells hot tubs. Bliss. 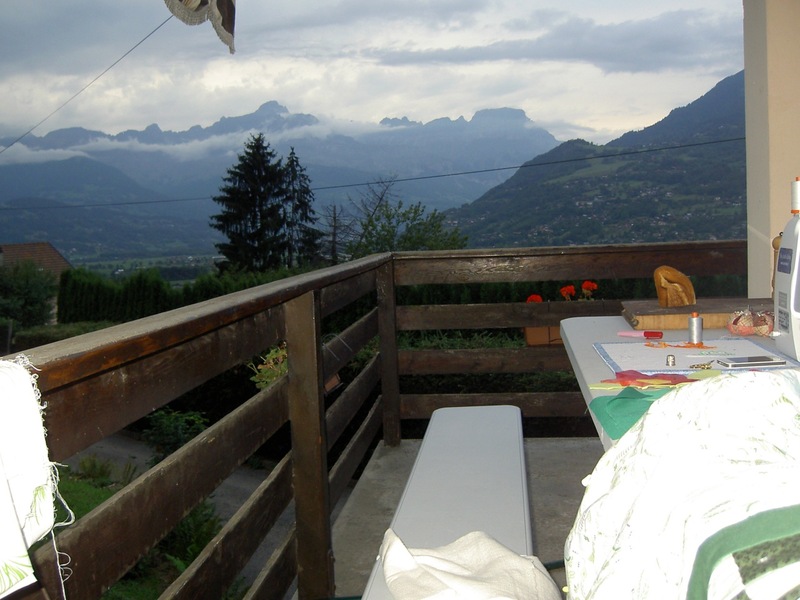 The balcony proved to be a splendid place to sew, as well as to eat on, covered with the extending roof when slight drizzle blocked the view. We were, after all, at the foot of the highest mountains in mainland Europe. The Mont Blanc was breathing down our necks. 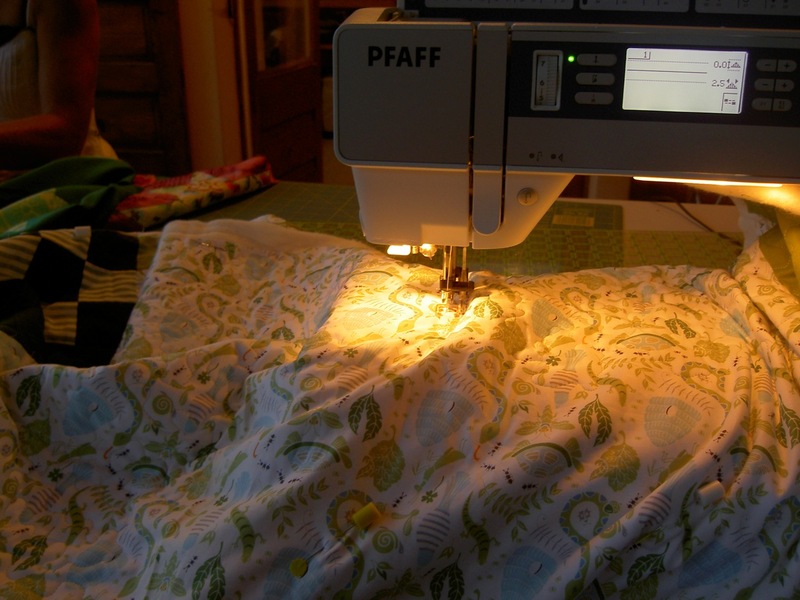 As the night moved in, the only light came from the sewing machine. Why have I never sewed outside before? This was heaven. 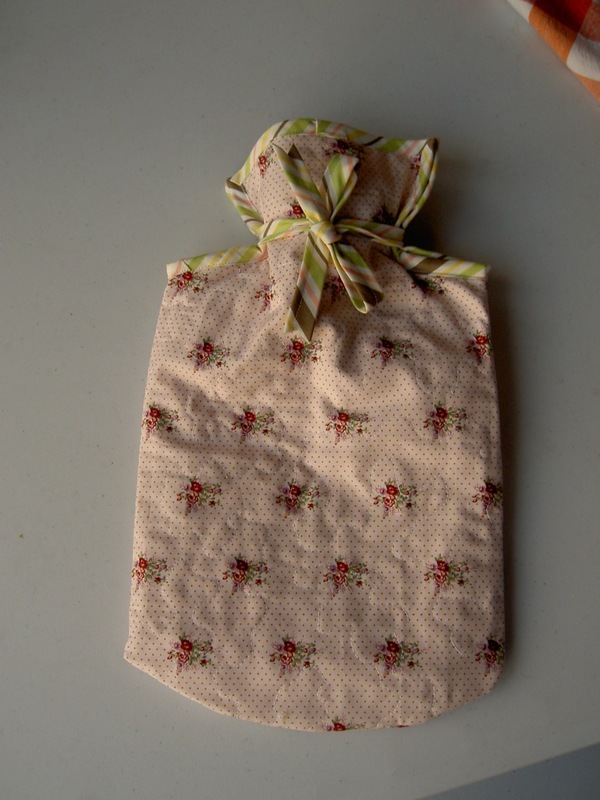 I started with an urgently-needed-to-make project: a hot water bottle cover for my dear mother. 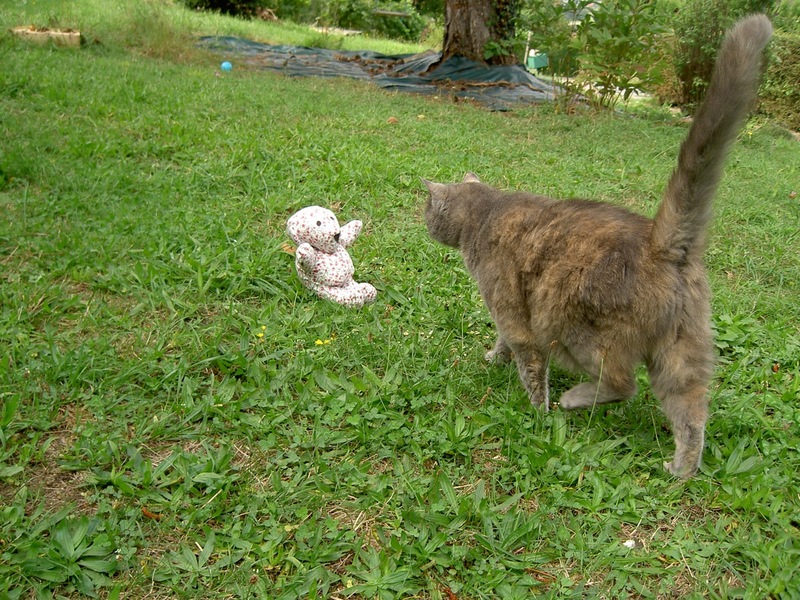 She has been telling me, oh-so-clearly, that she needs a new one. Burn marks on her back were a pretty good argument! So I hope this meets the requirement of not-too-thin and not-too-thick? The batting is more of a sort of thick calico than anything else. 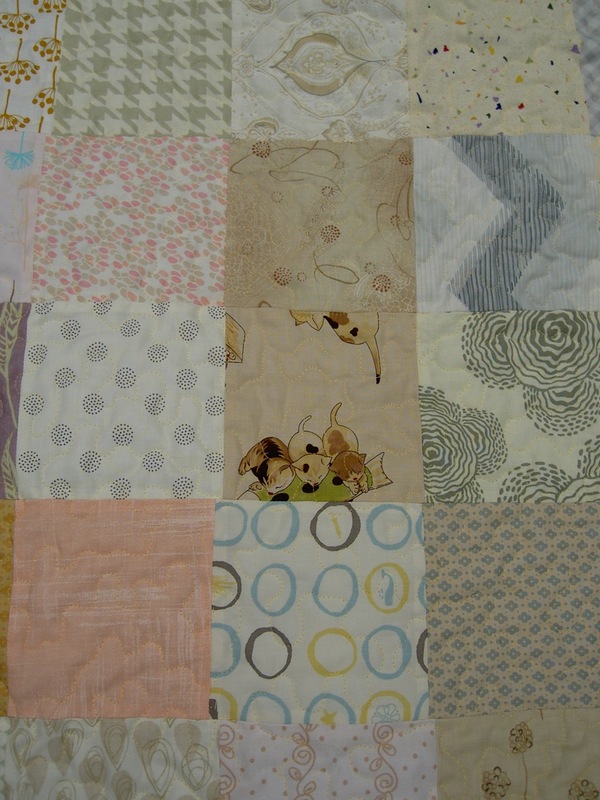 Then, powered on by Ms G’s endless and excellent food, I finished a baby quilt for a friend and colleague. He had cared so sweetly for me when I was sick in Japan, during the Tokyo Great Quilt Festival (and the scientific conference I attended before that was the real reason for going to Japan…). It will be nice to be able to give something back. I used the charm squares from a ‘low-volume‘ block swap that I took part in last year. These seemed like nice baby colours, perfectly matched with spit-up-milk and baby drool. 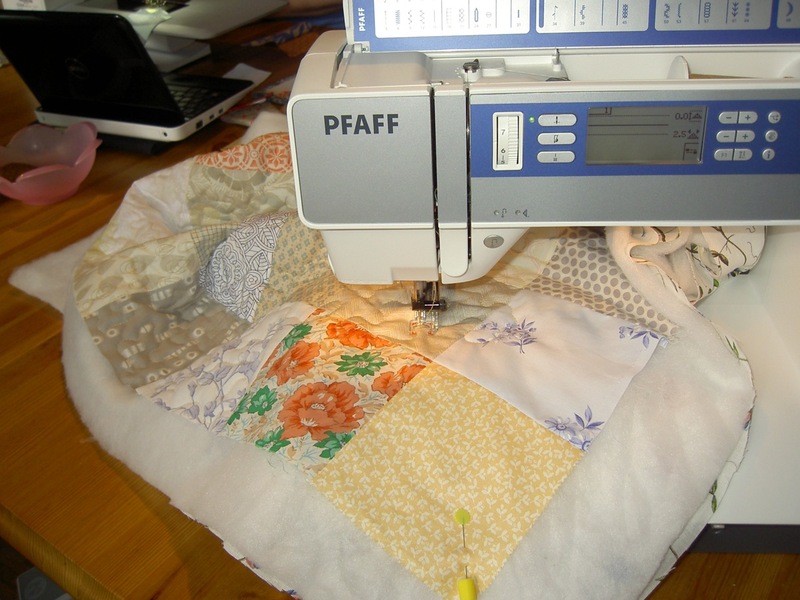 It is such fun to make baby quilts, and sewing in squares comes together so fast. It was lovely to have a finish early on in the weekend – it fired me on. 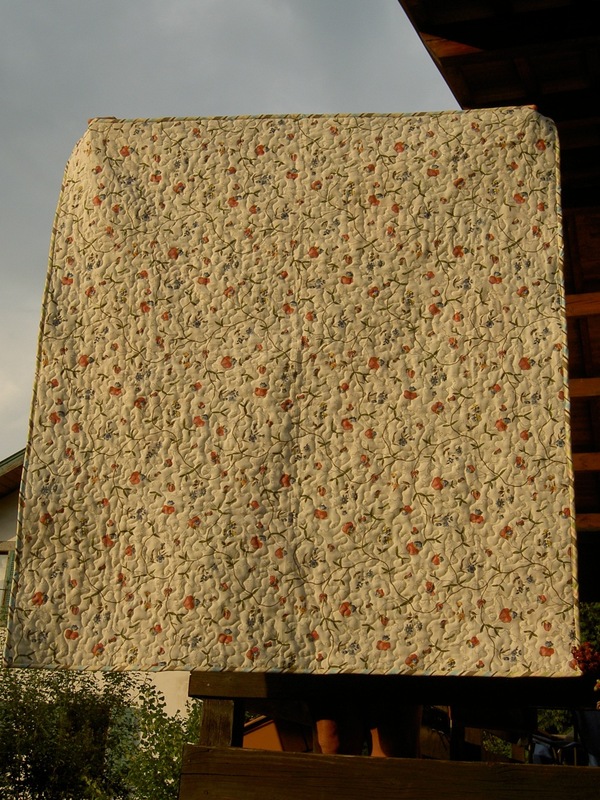 The back was the last appearance of a piece of duvet cover from the big Swedish store. 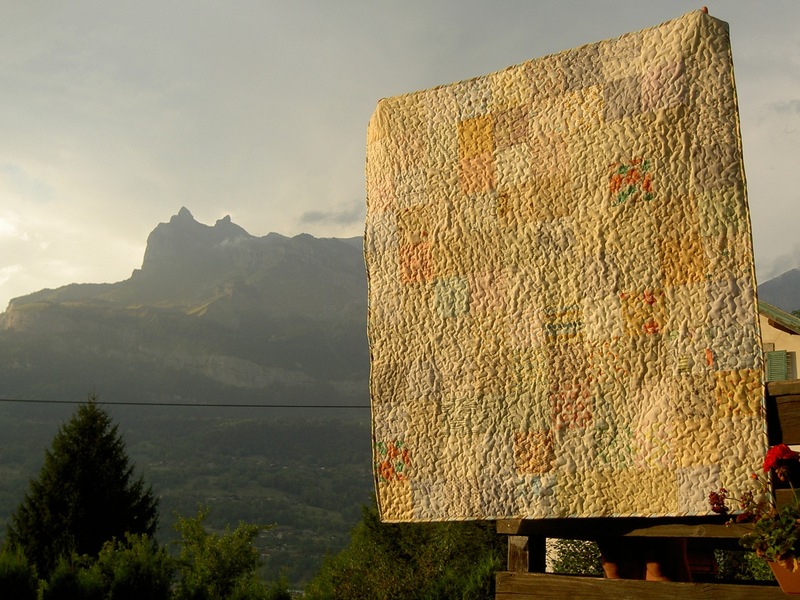 I think this is the third quilt I use this for: a double duvet cover does translate into a huge amount of fabric. Here is another shot of it in Ms G’s pretty chicken-filled garden. Isn’t that little house simply gorgeous? Not all of it is so pale, but I think the muted tones come together nicely. I removed the one offending square, so thank you to those who commented that it was indeed too dark! 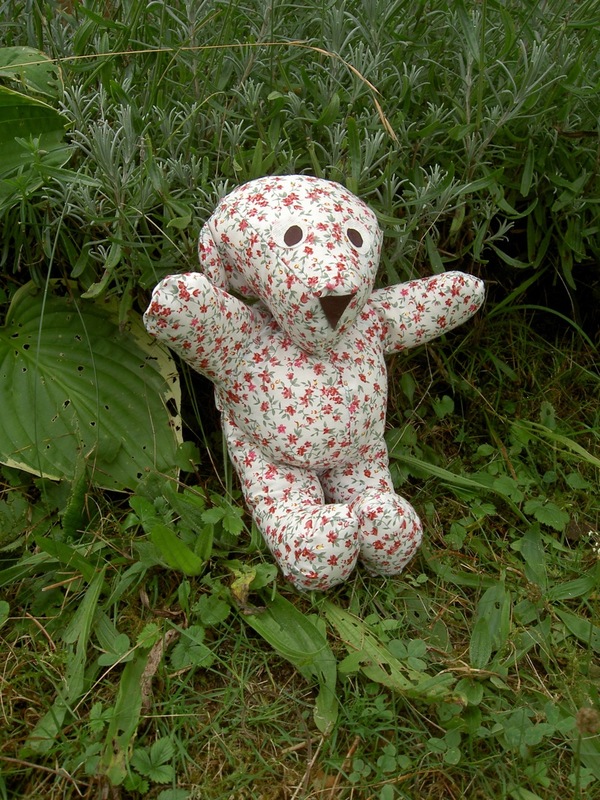 Then, just to stretch myself, I decided to make a fabric bear. I had seen one that looked sweet in a shop in Paris. I imagined this would just take a couple of hours. How wrong I was! I have never made a complicated beasty, and the pattern I had from a shop in Paris was utterly useless! I can remember asking the Grumpy Lady to walk me through the pattern briefly before I bought it but she brushed me off. “Mais c’est très facile!”. The explanations were on one side of a tiny sheet, very very limited. They might make sense if you have made oodles of bears. I hadn’t. I swore and swore, but eventually made something that could pass for a bear, even if it really looks like a fat sheep with a very odd shaped bottom. I gave her an extra tummy tuck at the end. I’m sure the ears ended up in the wrong place, and should be on top. I was surprised she didn’t end up having her toes sticking backwards, frankly, I was so confused most of the time about which bit to sew where. To recover from the excitement of surviving making her, we ate some more… It was still only Saturday afternoon. 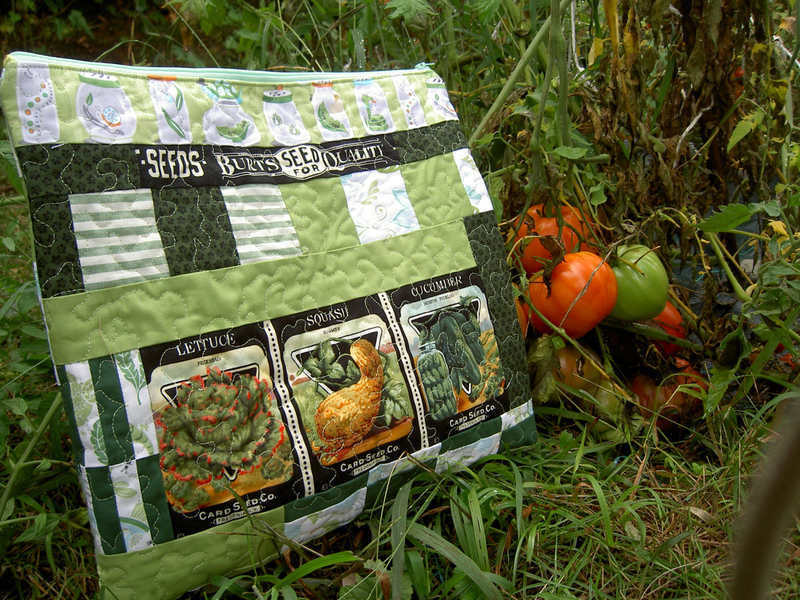 So I started another quilt, this time for a very lovely doctoral student who is working on urban gardening. I started by throwing together some 16-patches as a starting point, then laid them out on a bed-doubling-as-a-design-board. Ms G was trying, heroically, to get me to stretch my perspective and go all modern. 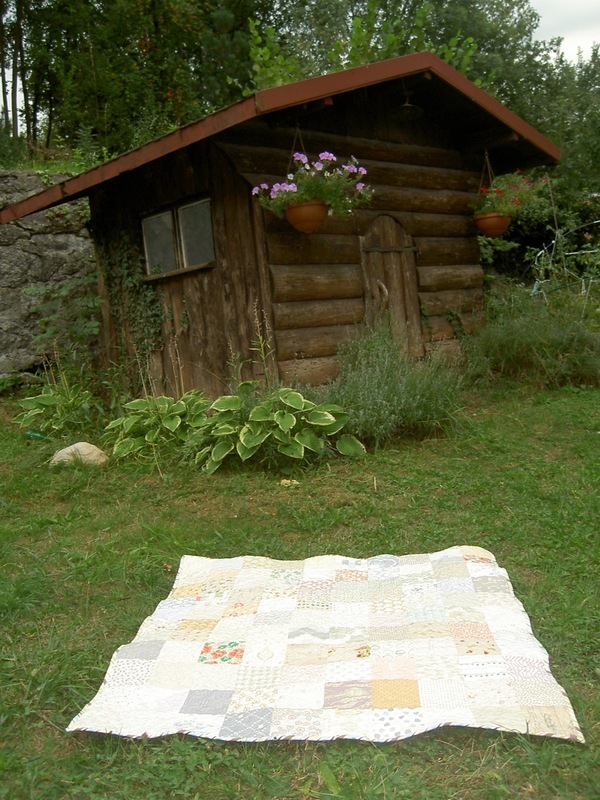 I resisted, equally heroically, and ended up… with a quilt made of squares. Not so great for stretching my creativity, but at least it meant I could finish it within the time I had left! The front is therefore square-ish, and lovely and green. I think it looks so nice and fresh. I’m not sure which way is up, but probably not this way. 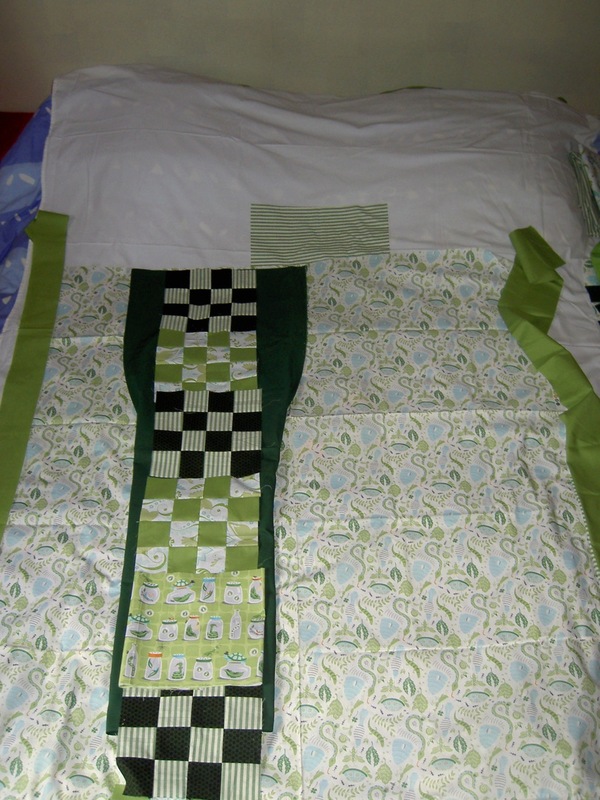 The pattern on the fabric means the pieced strip is better going up and down on the right. 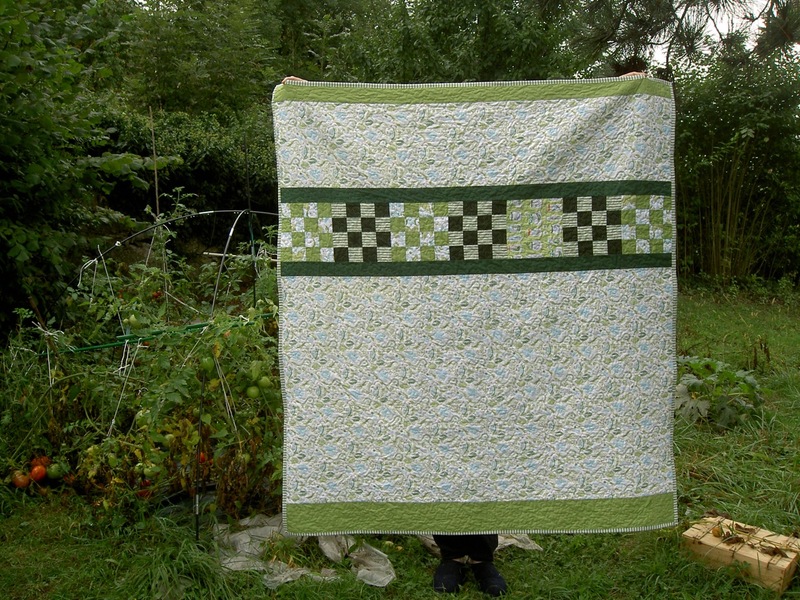 I did a mad session of quilting on Sunday morning, and managed to finish and bind it in record time. The girls were so understanding of my very noisy and unending stippling that made the whole table shake, and rather threatened conversation… The back, true to her thesis topic of gardening, is also from a duvet cover. I just love it! 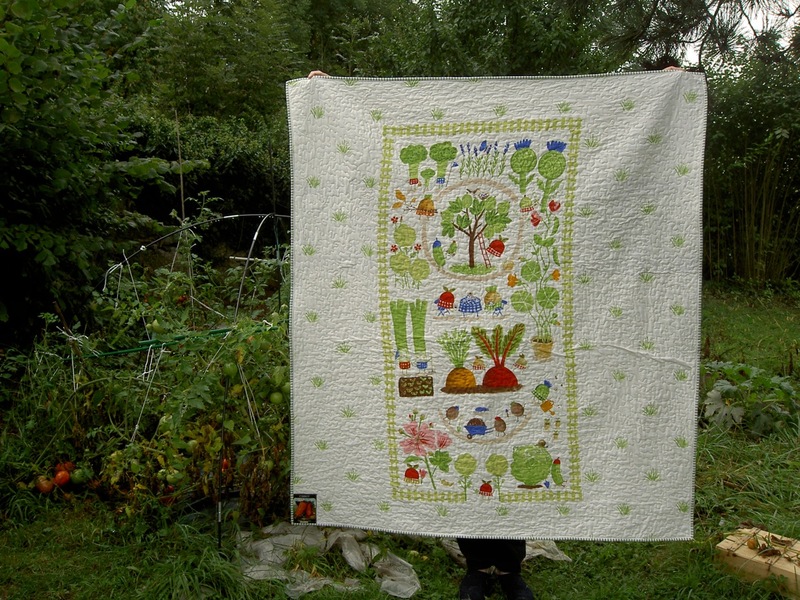 How many quilts have dancing broccoli and intrepid carrots on their backs? Plus I just love the little potato men you can barely see here. Trust me, they are sweet! 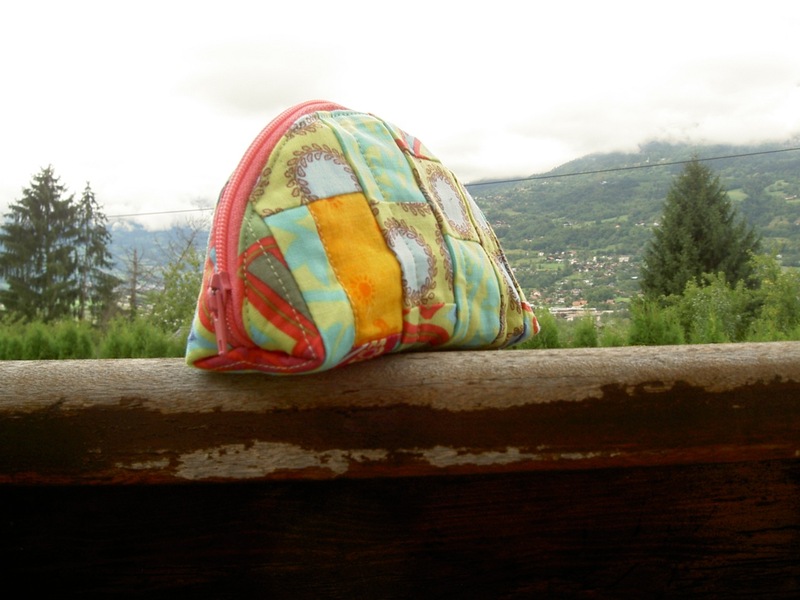 Using some of the left-over fabric, I then made a quick little pouch, just for the pleasure of trying to show Ms G that I could also try to do unplanned piecing, and wouldn’t always resist her kind suggestions for stepping outside my comfort zone. I don’t think she was convinced. 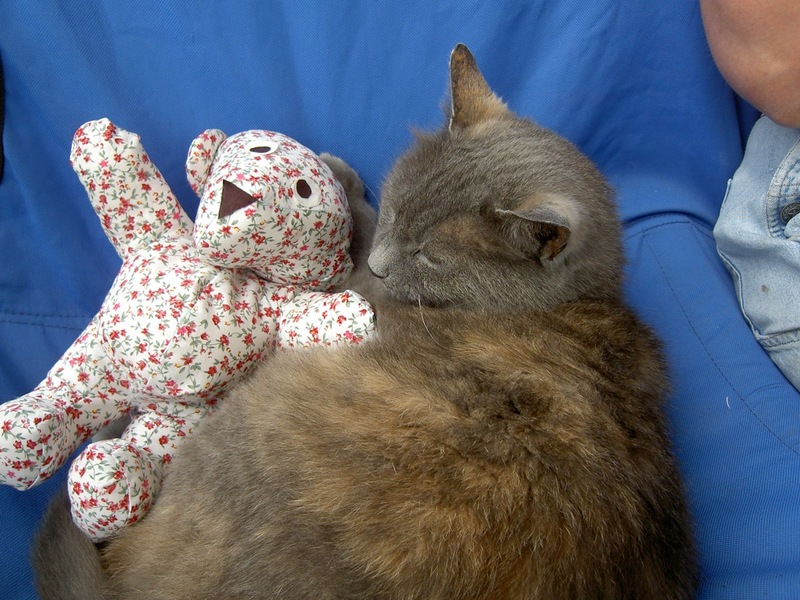 Although it matches the quilt rather nicely, and should probably stay with it, I’ll keep this one. It’s perfect for carrying sewing bits and pieces around. But probably not tomatoes. There was just a tiny bit of time left on Sunday to make a little dumpling bag from the tiny scraps generated by all our respective projects, as learnt during a proper Peaks retreat. I made it for one of our friends who couldn’t come. We missed her calm chuckle and endless wisdom. While I sewed like a lunatic, and did no cooking at all other than buy croissants for breakfast, Bee blocks were completed by Ms G & Ms E in a great variety of styles, Ms A finished a beautiful quilt top in marvelous Kaffe Fasset colours, and Ms G finished a square quilt (I fear I may have contaminated her!) backed in beautiful soft pink minky. It was a marvelous weekend! I couldn’t have done all this without my kind friends who were so understanding of my desire to just power on and sew sew sew somewhat maniacally, and produced meals regularly and kept the music going. I had been wanting to do this all summer! But now work beckons, and the university teaching term is almost upon me. A very different sort of productivity is calling. Not sleeping enough + risking alienating your friends by never washing up or cooking or doing anything remotely communal + not going out at all + barely getting your bum off your sewing machine if not to iron = a productive weekend. But, possibly, neither desirable nor sustainable in the long-run, particularly if I ever want to be invited back! I wouldn’t recommend it! What a wonderful weekend! How fun to stitch in the company of others who like to do the same thing. You really accomplished a lot in a short amount of time!